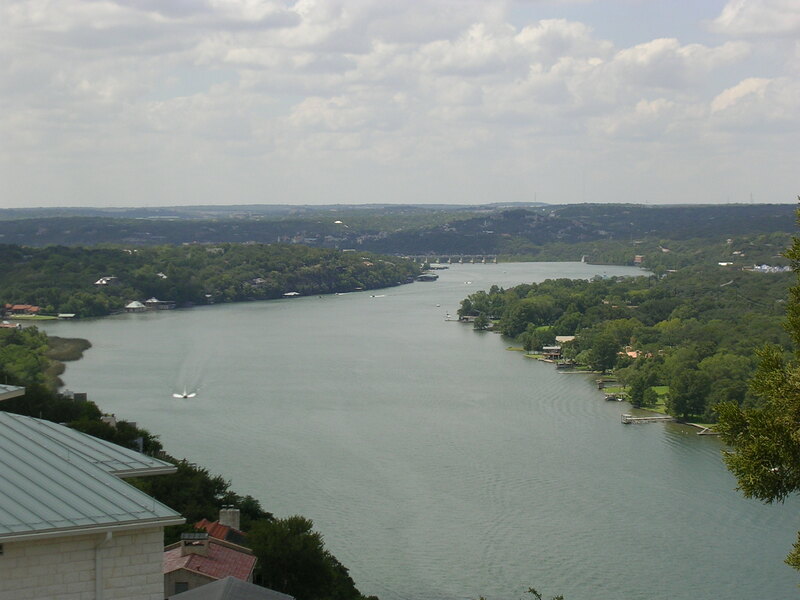 While my dad was working in Austin, I visited him for a little bit. I drove from Cleveland in my dad's Mustang to see my grandparents in Oklahoma, and then drove down to Austin to drop off the car. 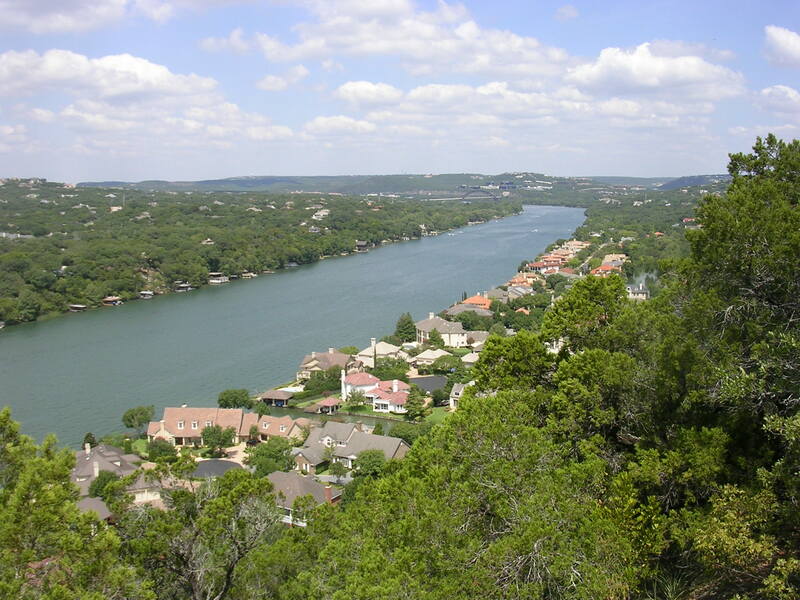 So here are a few pictures of the Austin area, which really is quite nice. 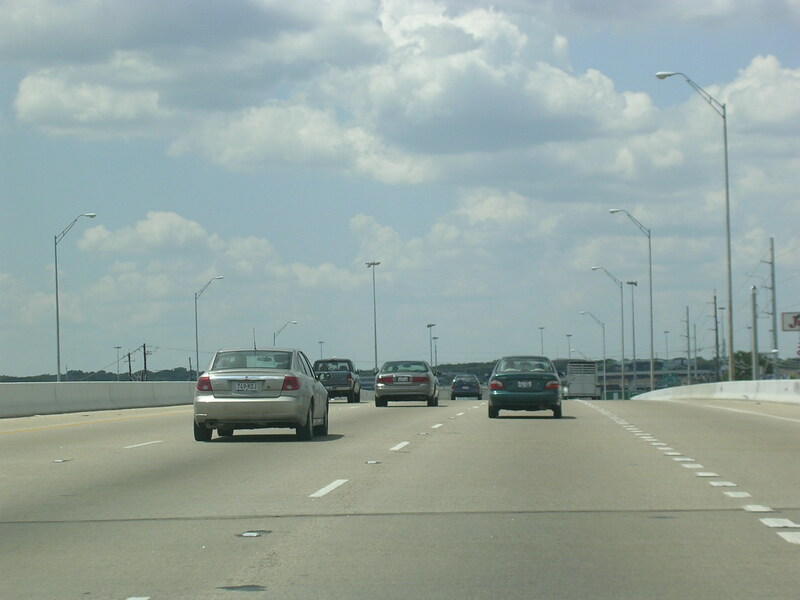 This is FM 2222 WB in the northern parts of the city. My dad told me this was a cool road and he was right! 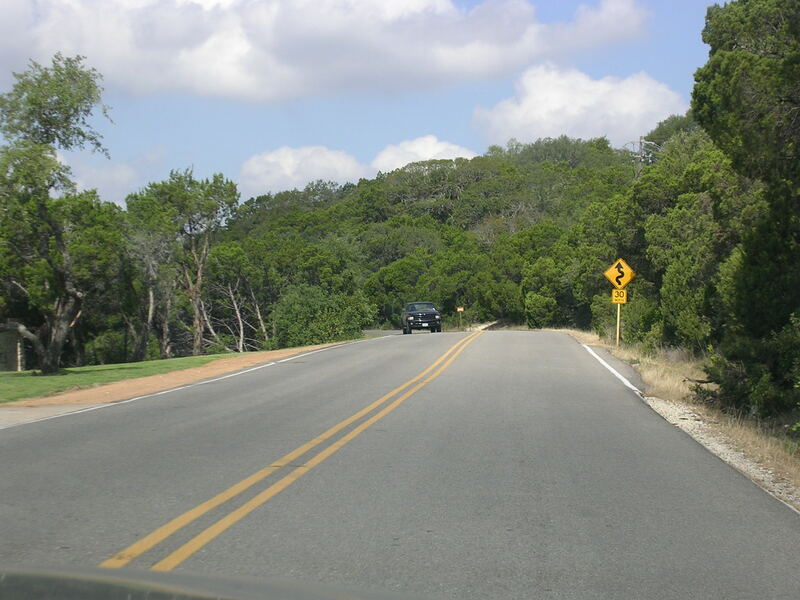 Continuing on FM 2222. Nice number, eh? 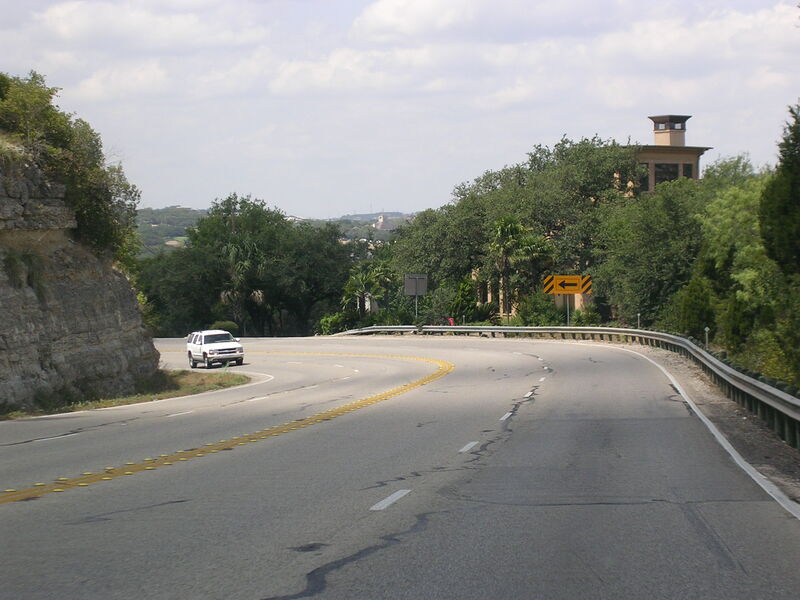 The road is at least 4 lanes at all times and is really windy and hilly. Speed Limit? 60. 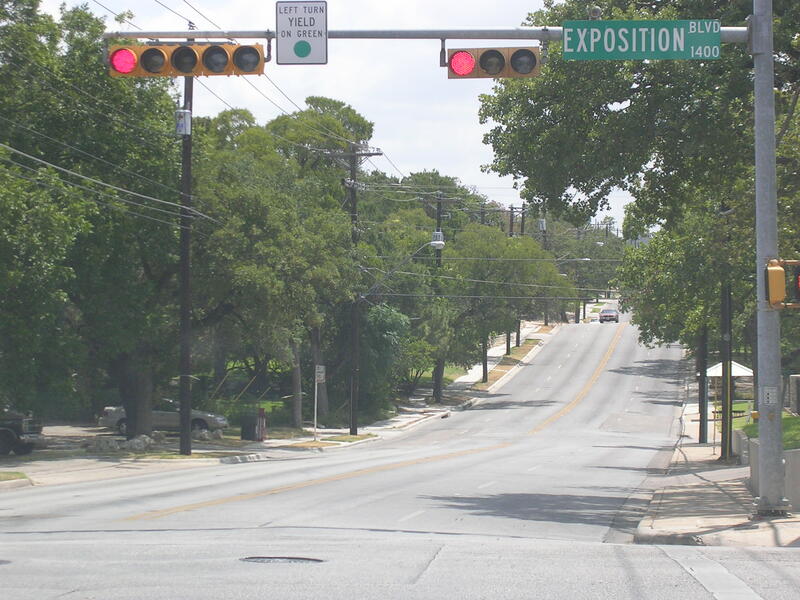 There are a few stoplights and some traffic, too. 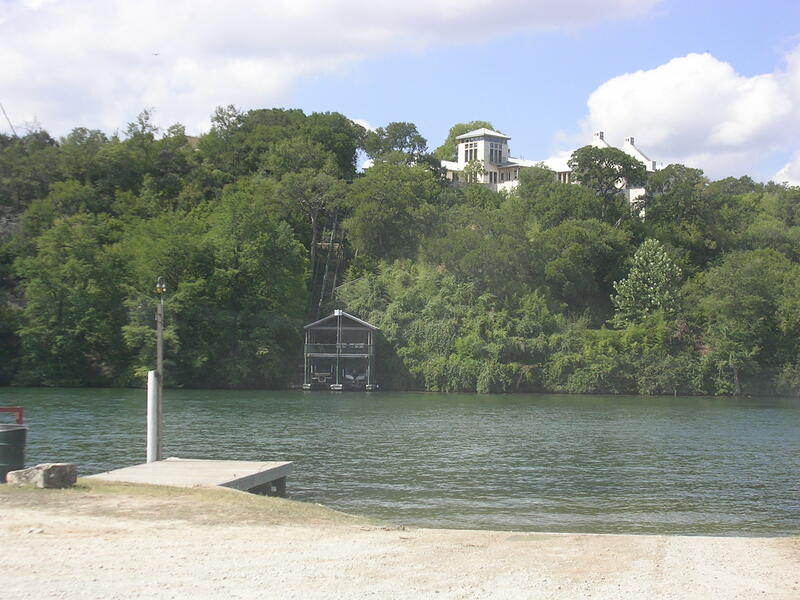 Now this is City Park Road, which leads to a, well, city park on Lake Austin. 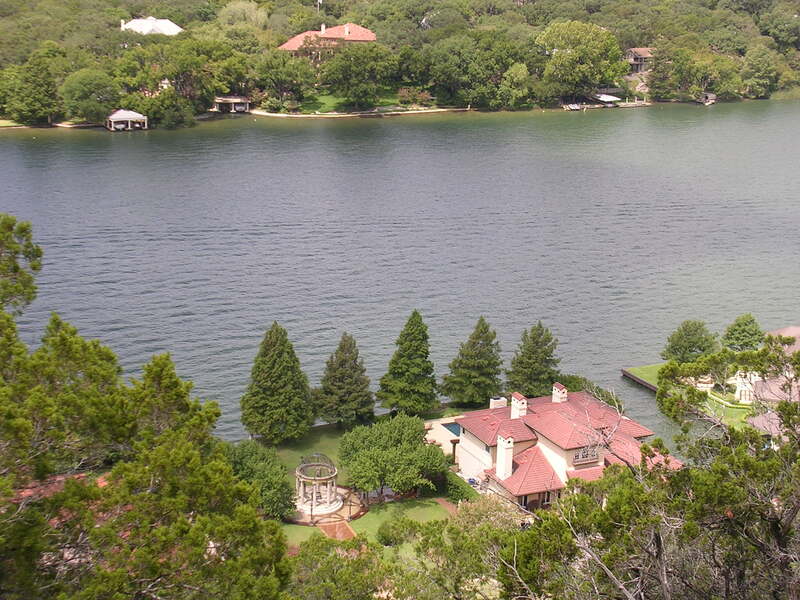 We're down in the park looking up at a huge house overlooking the lake. 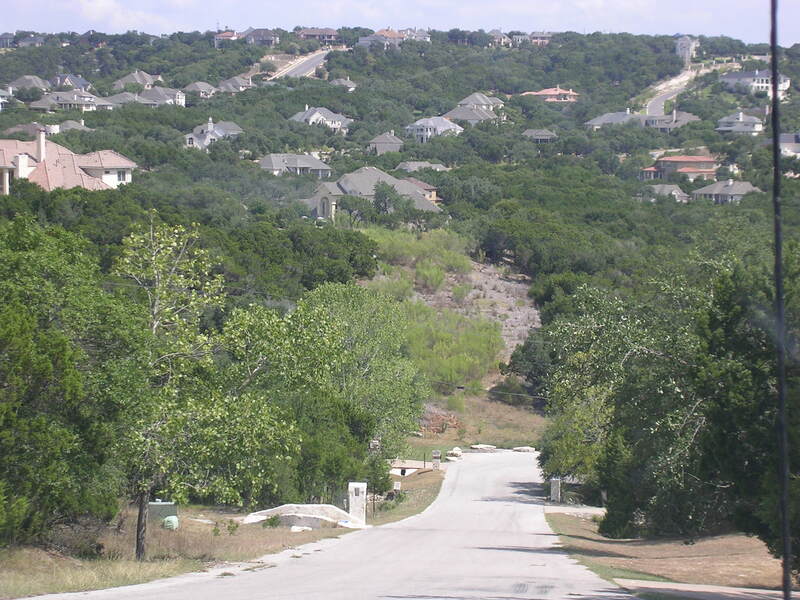 In one of the rich neighborhoods with huge houses on the tops of the hills and canyons. A look at the lake (which is part of the Colorado River-- no not THAT Colorado River) from a scenic turnoff of FM 2222. 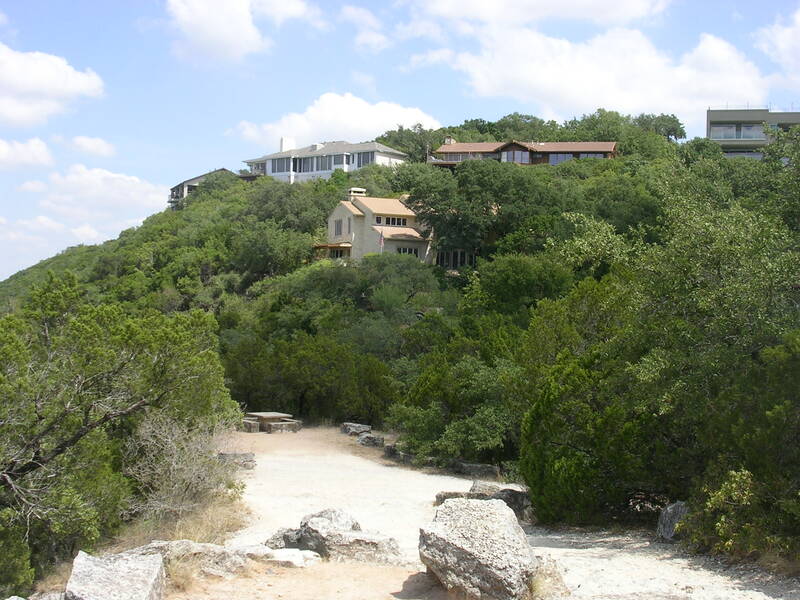 There are plenty of expensive and huge houses in this part of Texas. Some on the cliffs and some right at the water's edge. Yeesh. 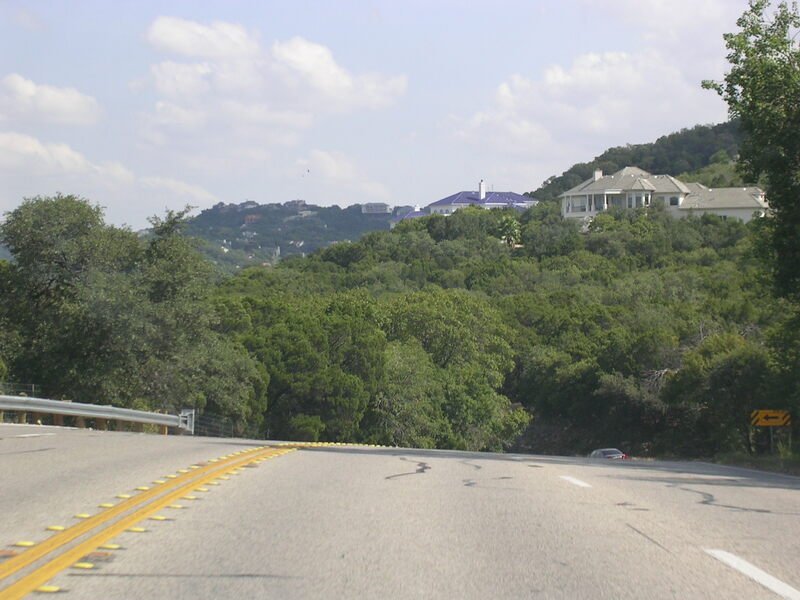 Looking at some hilltop houses at the scenic turnoff. 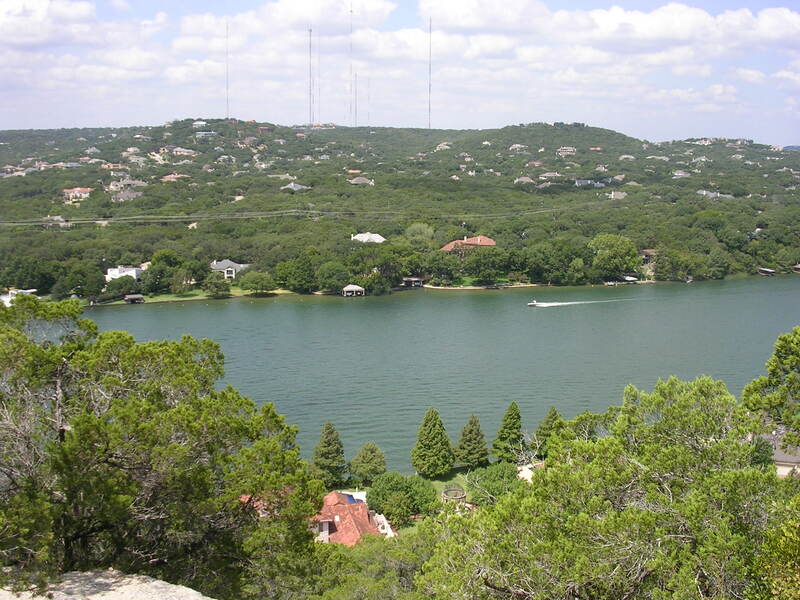 This is looking back toward the city. Sorta. 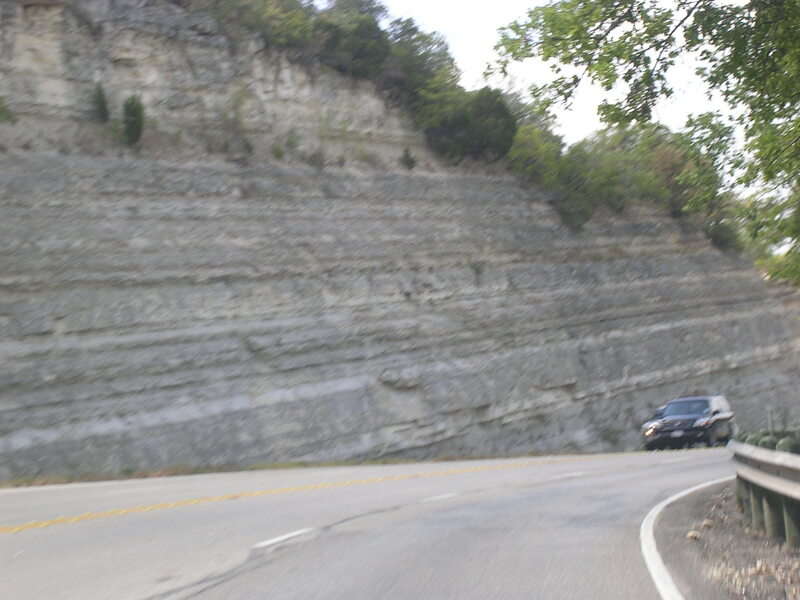 Going through a rock cut on FM 2222 EB. Sharp curve ahead! I was pretty lost, to tell you the truth, so I don't know where the heck this picture was taken. But it was some road crossing Exposition Blvd. in case you can't read. 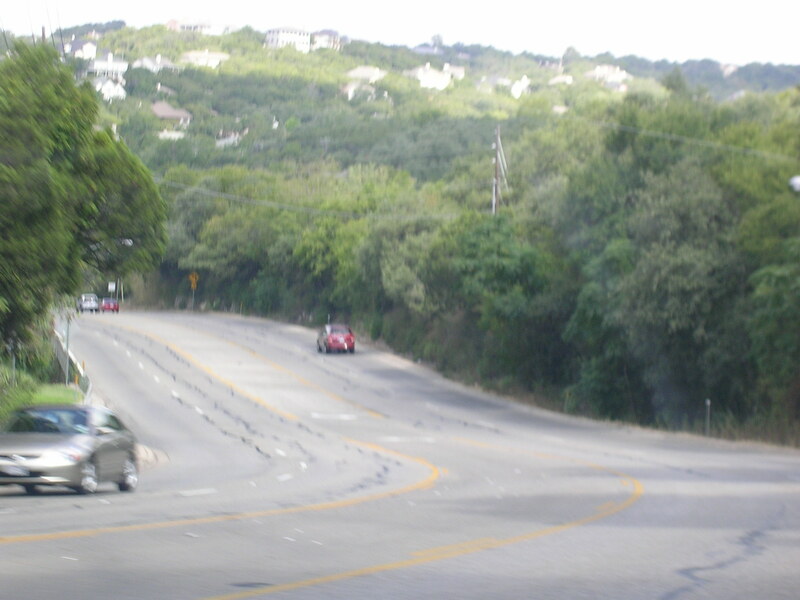 Another road in Austin. Somehow, my dad got us back downtown. 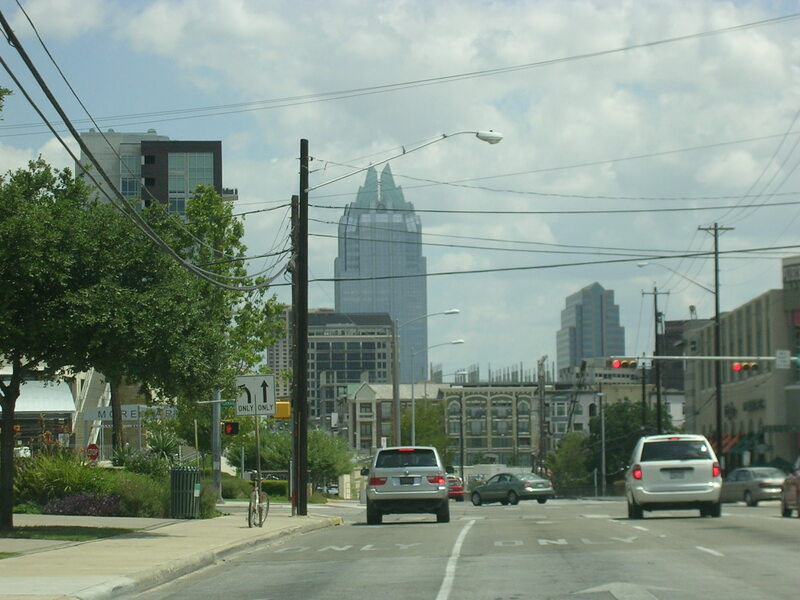 US 183 kinda skirts the city. 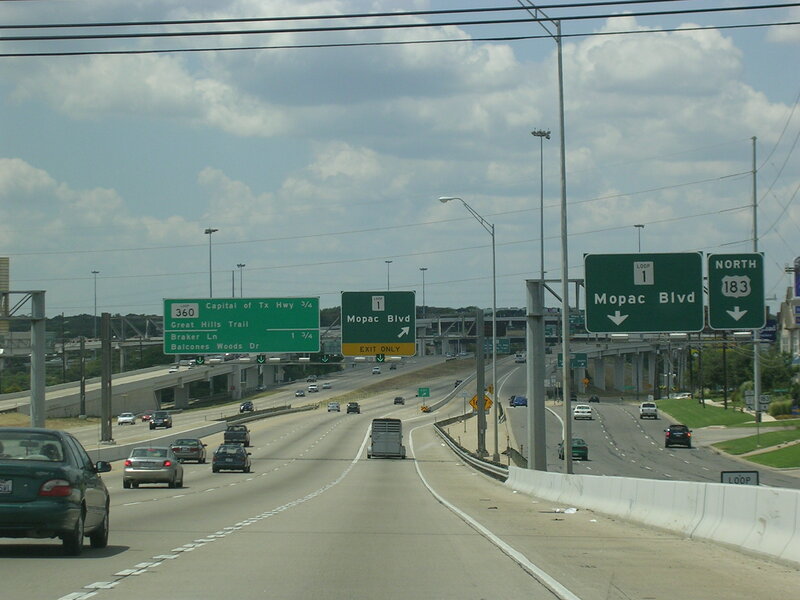 It is a freeway north of I-35 and an expressway south of it. 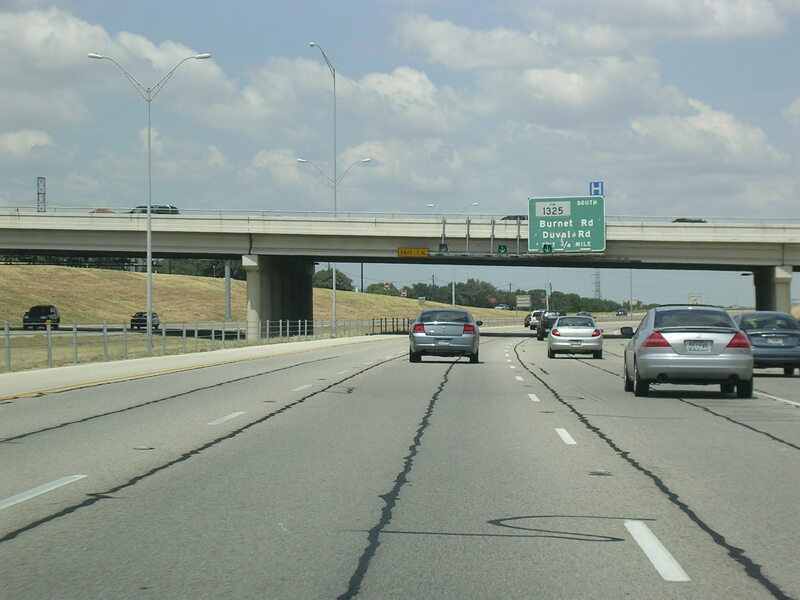 The freeway US 183 is wide and elevated. 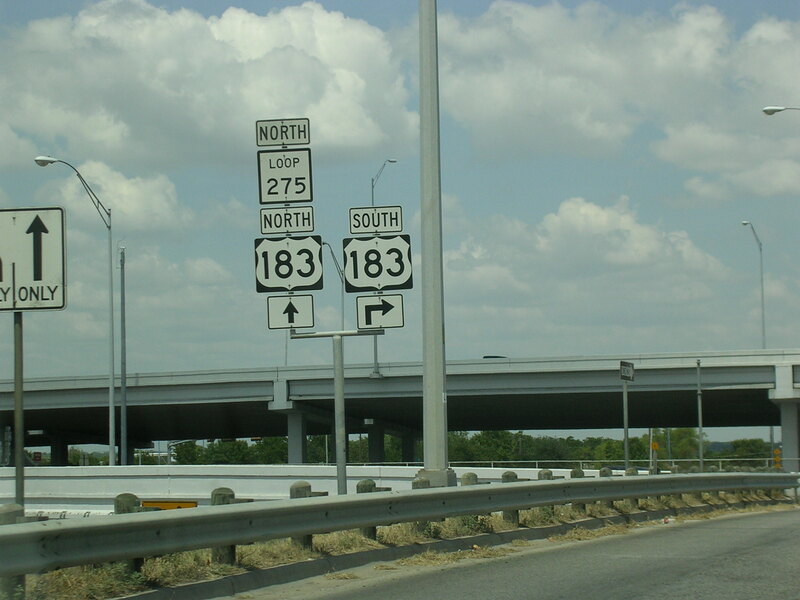 US 183 NB at Loop 1, the Mopac Expressway. 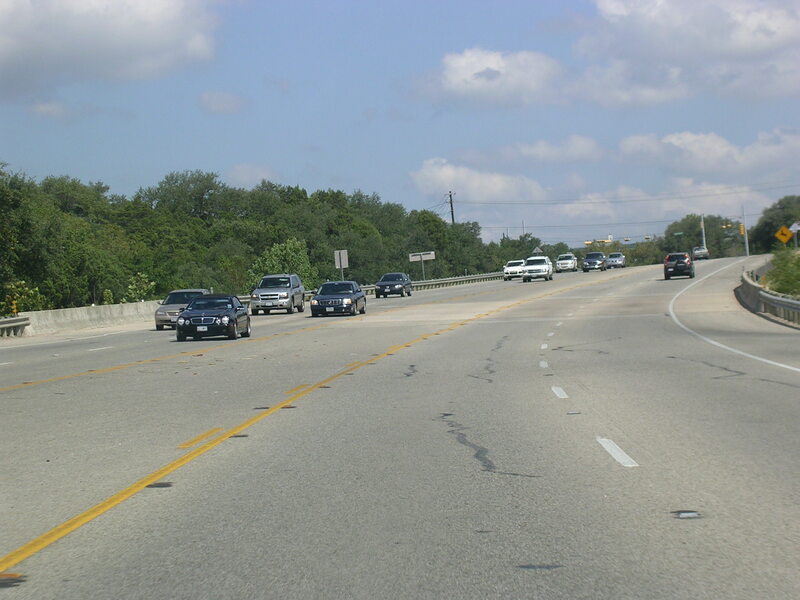 I think the C/D lanes you see on the right are Old US 183. 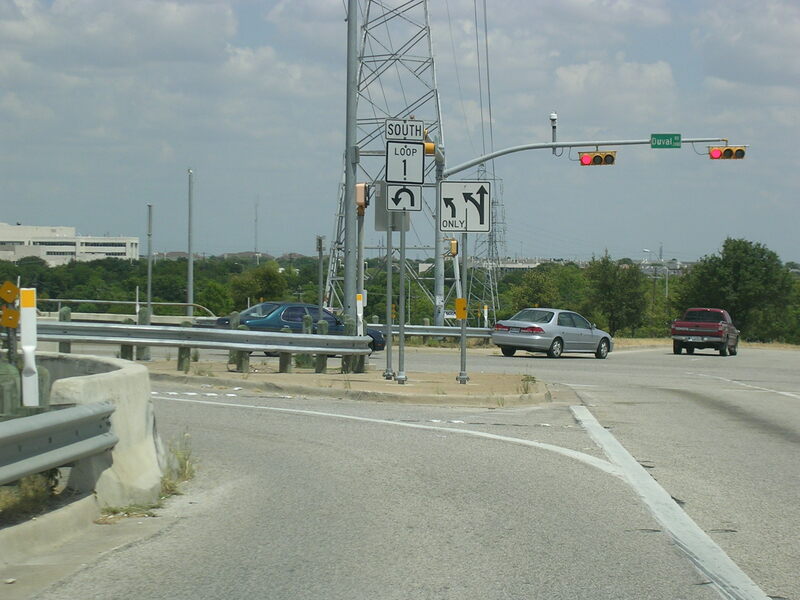 Taking the exit for Loop 1, the Mopac Expy. 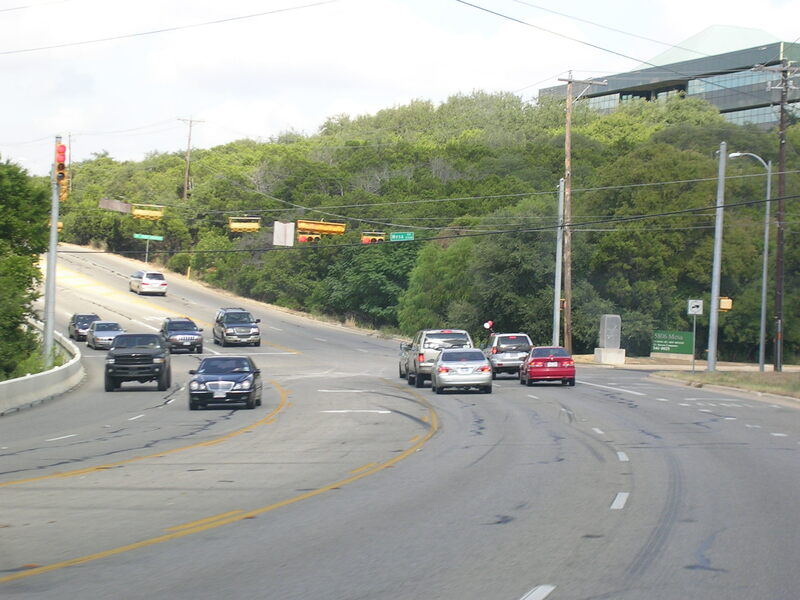 Mopac stands for Missouri Pacific like the railway that ran through here. I knew that before even coming here!! I'm so cool. Duval Rd. is where Dad's apartment was. These BGSs are faded. 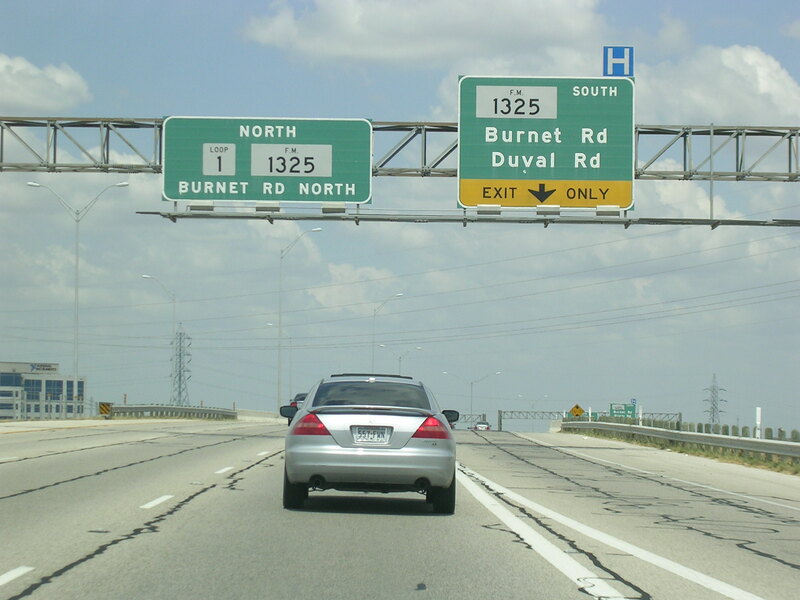 These wacky Texas interchanges have an option to turn around and go back where you came from, as evidenced here. 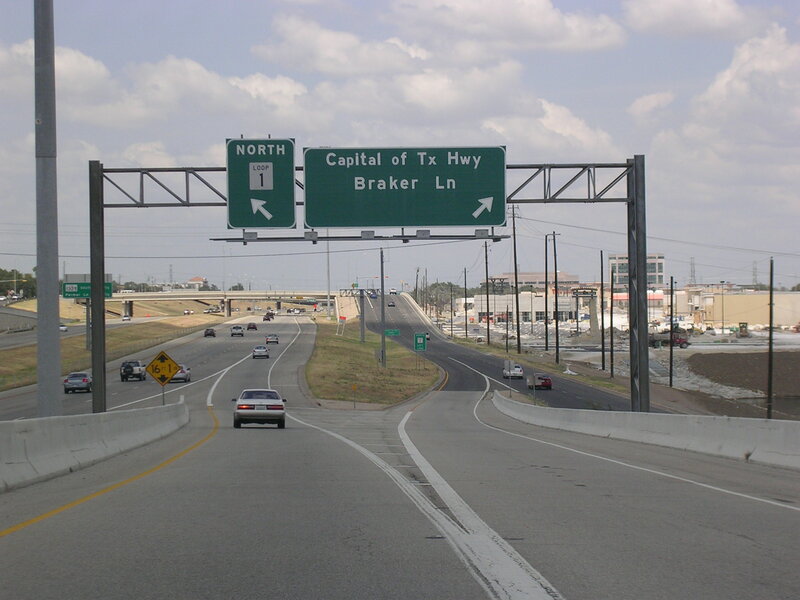 We're back later at the Loop 1 and US 183 interchange. 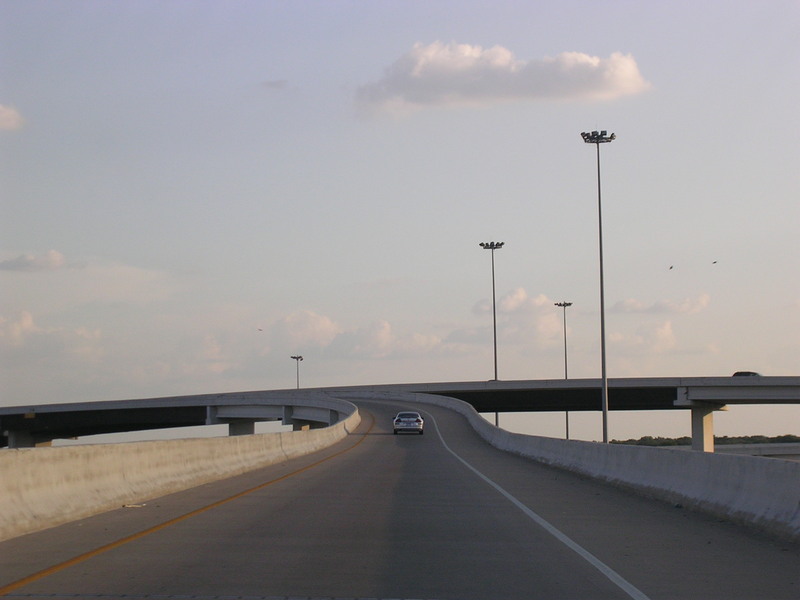 This is the longest flyover ramp I've ever been on, going from Loop 1 SB to US 183 SB. Good view of the city, too, although I didn't get it on camera. 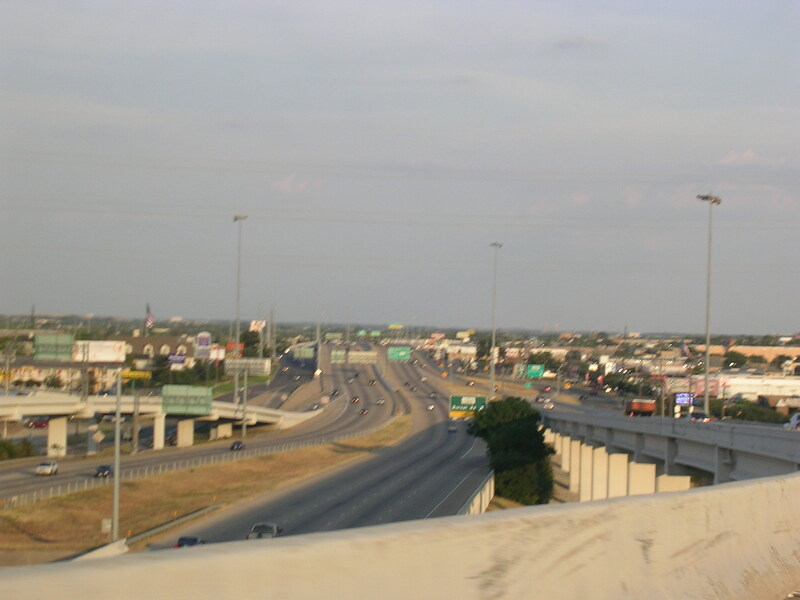 A blurry view of US 183 and its surroundings from the flyover. 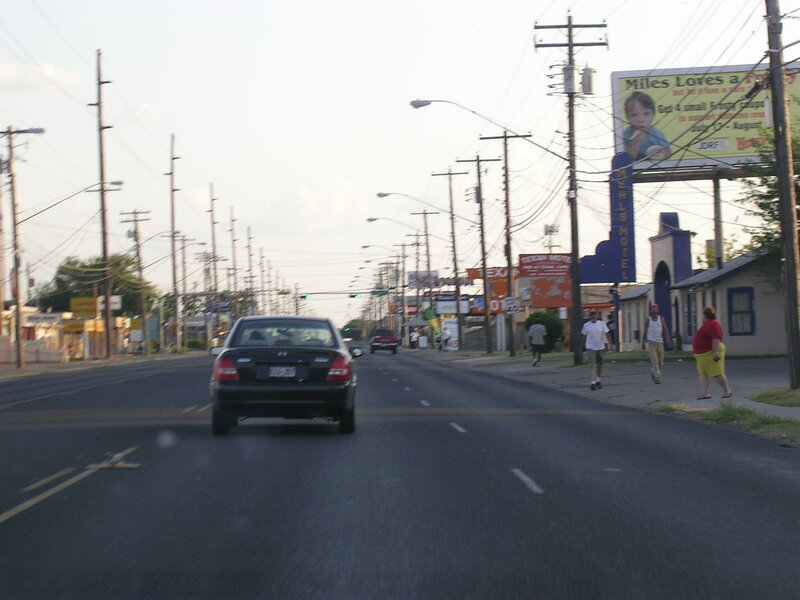 SB Lamar Blvd. 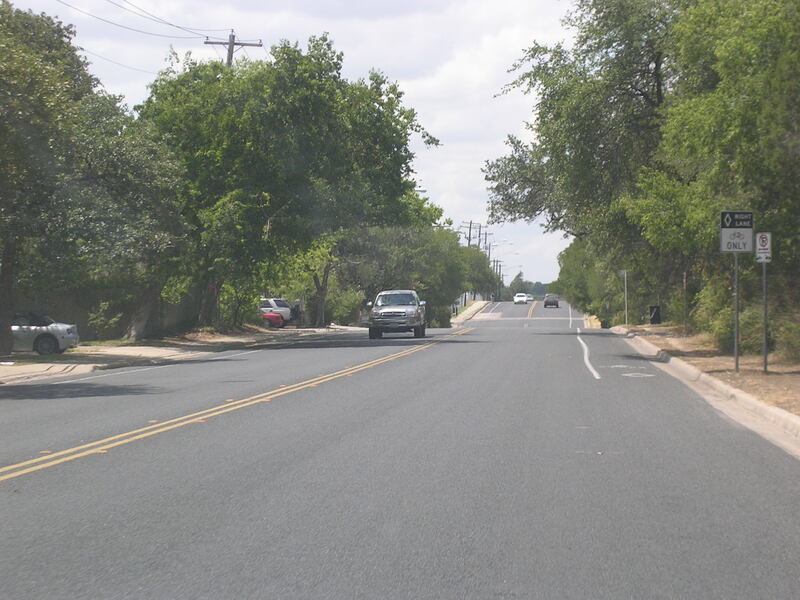 The restaurant that Janis Joplin played at early in her career is on this road, and is called Threadgill's. Alrighty then, that's about it for Austin. No pics from downtown because I only went there at night. But it is a really cool place to be! Live music and good food and weird old dudes in thongs on the side of the road.